Parents can take comfort in the knowledge that there are a team of supporters who gather round each boy and nurture his well being. Students at Year 7 are offered a challenging and differentiated curriculum. The program is delivered in our purpose built learning centre, Becchi. Becchi offers flexible learning spaces where students can participate effectively in a broad range of learning experiences from traditional teacher instruction to small and large group tasks, individual research tasks and much more. 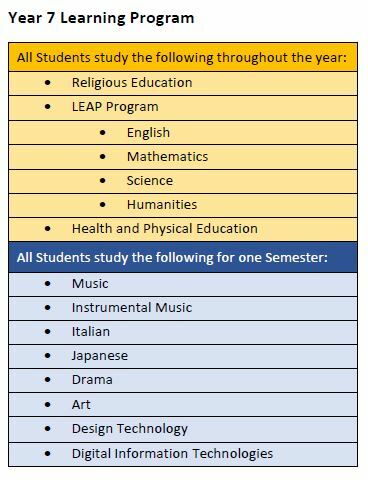 The Year 7 Program includes our LEAP program (English, History, Science and Mathematics), Languages (Italian and Japanese), Health and PE (including Sport), Religious Education (including weekly Mass), Creative and Performing Arts (Music, Drama and Visual Arts) as well as Technology (Woodwork). All subjects are delivered with a focus on developing excellent habits of mind. All students at Year 7 have the opportunity to undertake a full year of Instrumental Music. Students can continue with Instrumental Music as part of their learning program throughout their time at St Joseph’s. They are encouraged to involve themselves in the extra-curricula programs offered at the school; including inter-school sport programs, College productions, debating, bands etc. Pastoral care is a key consideration of the program. Students are supported throughout their time at St Joseph’s to develop resilience and excellent relationships with students and staff. This process commences early in the year when all students participate in a three-day camp at Dromana. In keeping with the expectations of the Australian Curriculum and the principles of the Melbourne Declaration on Educational Goals for Young Australians (2008) the Year 7 LEAP is specifically designed to provide students with all necessary skills and knowledge to prepare them for excellence in their secondary education and beyond. The LEAP program involves the four learning areas of English, Humanities (Geography and History), Science and Mathematics. The teaching and learning program is varied, involving ideal quantities of direct teacher instruction as well as significant opportunity for project-based inquiry. A pair of teacher collaborators with skill and expertise generally delivers LEAP across the four subject disciplines. The teacher-learner relationship is a key attribute of the LEAP program. Teachers become particularly attuned to the learning needs of their class and are able to provide a suitably differentiated and challenging curriculum for each student. Boys develop their full potential at varied rates across their schooling. For many, a standard program could be more or less than challenging. Consequently, through careful assessment processes teachers are able to cater for individual differences within and beyond the mainstream classroom. Students with particular learning needs (consolidation or extension requirements) may be nominated to participate in LANE (Literacy and Numeracy Support) or GATE (Gifted and Talented Enhancement) programs.